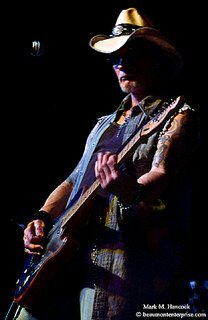 Steven Pahl with the band Navasota Rio of Conroe, Texas performs during the Janis Joplin Birthday Bash at the Carl A. Parker Multipurpose Center at Lamar State College-Port Arthur on Saturday, Jan. 28, 2006. Lamar's Brandon Chappell (No. 1, right) defends against Delta State's Travis DeGroot (No. 11, left) during a college basketball game at Lamar University in Beaumont on Friday, Dec. 30, 2005. Students scream and move away from the Doan Lan Phat Chua Buu Mon lion dancers at Dowling Elementary School in Port Acres on Wednesday, Jan. 25, 2006. 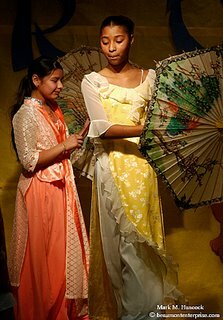 Amanda Swallow (right) and Tammy Zamarripa (left) participate in a fashion show at Dowling Elementary School in Port Acres. The performance was part of the Lunar New Year, or Tet, celebration, which occurs on Sunday. The new year is the year of the dog. 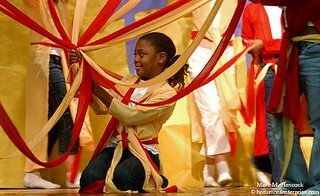 Second-grader Taylor Greene performs a traditional dance with other students at Dowling Elementary School. 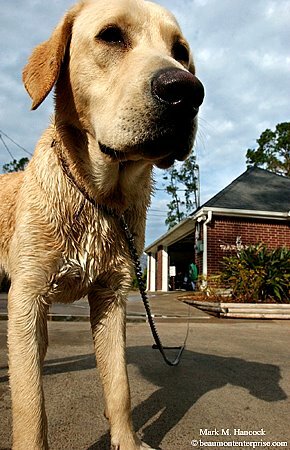 Rosco, a 9-month-old golden labrador retriever owned by Neil Spiller, dries in the sun after a bath at his home in Pinewood on Saturday, Jan. 21, 2006. Workers with the inmate labor program at Larry Gist State Jail move a pre-framed wall into position before a Beaumont Habitat for Humanity kick off program in Beaumont on Tuesday, Jan. 24, 2006. The Rita Recovery 2006 Program hopes to draw donations of labor and funds to rebuild homes for Hurricane Rita victims. Dan Selan (right), a photojournalist at WGBA-TV of Green Bay, Wisc. tapes Beaumont council member Nancy Beaulieu (center) drive a ceremonial nail into a Beaumont Habitat for Humanity home in Beaumont on Tuesday, Jan. 24, 2006. 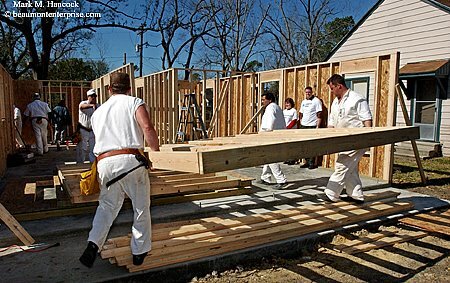 The first house under construction, called the "Texas Roadhouse," was arranged, pre-framed and delivered by WGBA-TV. 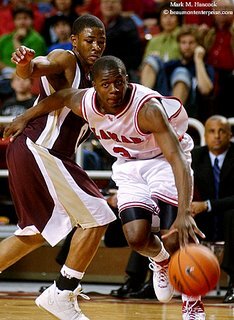 Lamar University's Brandon McThay (No. 3, right) works his way past Louisiana-Monroe's Tony Hooper (No. 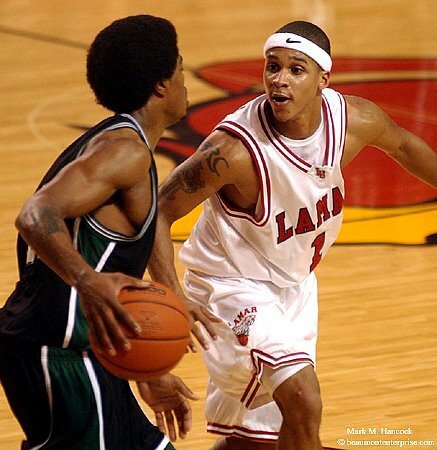 00, left) during a college basketball game at Lamar University in Beaumont on Thursday, Jan. 19, 2006. 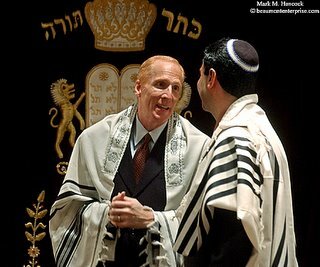 Temple president-elect Stephen Bender (left) and congregant Daniel Roubein (right) talk after a service in the Kol Israel old temple at Temple Emanuel in Beaumont on Saturday, Jan. 21, 2006. The temple has undergone a $1.7 million restoration. Esther Lasky-Mata (left) of San Antonio talks with Resanne Saltzman (center) and her husband Earl Saltzman (right) of Houston after a service in the Kol Israel old temple at Temple Emanuel in Beaumont. 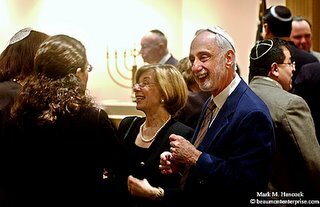 Kay Eldridge Stein of San Antonio talks with other guests during a dessert reception for the Temple Emanuel congregation at the Art Museum of Southeast Texas in Beaumont. 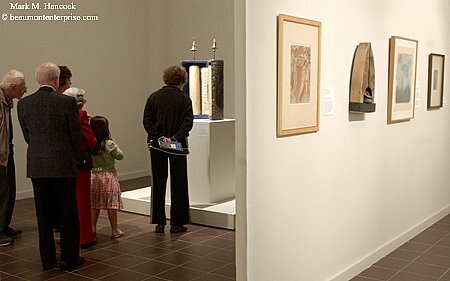 Guests view an 18th century Torah during a dessert reception for the Temple Emanuel congregation at the Art Museum of Southeast Texas. The museum features the "Art of the Hebrew Bible" exhibit from the Robert I. Kahn Gallery of Congregation Emanu El in Houston. Port Arthur Memorial High School's Dominique Keller (No. 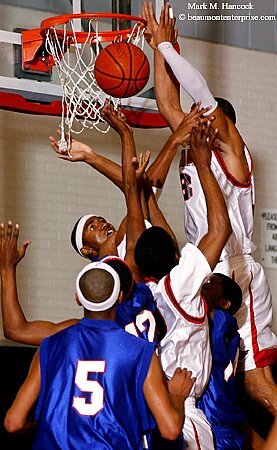 23, top) leaps above opponents during a basketball game against West Brook High School at the former Lincoln High School in Port Arthur on Friday, Jan. 20, 2006. A brown pelican hunts for fish near Pleasure Island in Port Arthur on Wednesday, Jan. 18, 2006. 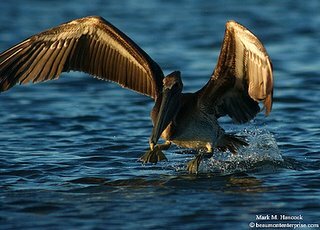 After Hurricane Katrina, only 25 percent of the Chandeleur Islands - the pelicans' natural habitat, remain. Many bird watchers are interested to see how this year's migration will change as a result of hurricanes Rita and Katrina. Please read "In search of a place to land" by Beth Gallaspy. 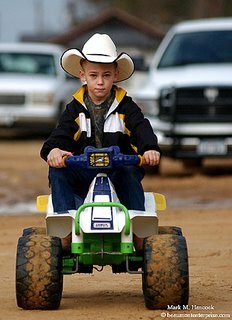 William Tyler poses for a portrait at his home in Beaumont on Thursday, Dec. 22, 2005. 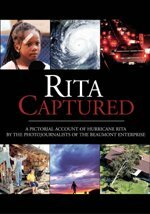 He was evacuated before Hurricane Rita with other special needs residents. Although the mass evacuation saved countless lives, there were no plans to return evacuees back to their homes after the hurricane. 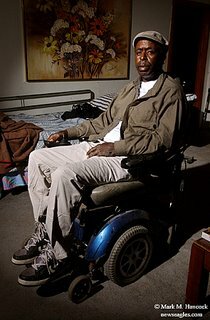 The American Red Cross eventually helped him pay for a Greyhound Bus ticket home from a nursing home in the Atlanta, Ga. area. Lamar's Brandon Chappell (No. 1, left) dives for the ball while Jason Grant (No. 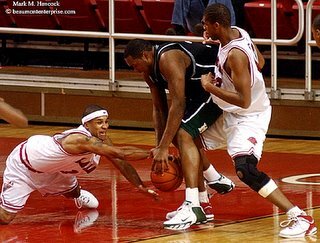 43, right) pushes into Delta State's Jasper Johnson (No. 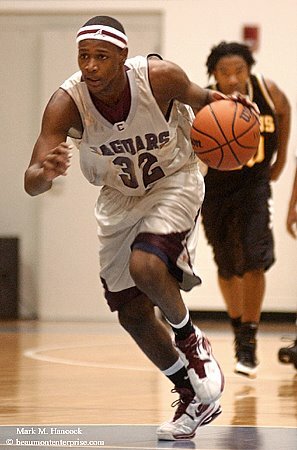 32, center) during a college basketball game at Lamar University in Beaumont on Friday, Dec. 30, 2005. 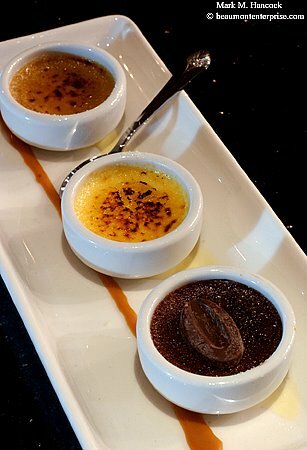 Suga's offers a Creme Brulee Sampler at the upscale restaurant in Beaumont on Tuesday, Dec. 20, 2005. Yesterday, we saw Shangri La Botanical Gardens & Nature Center before Hurricane Rita hit. Since then, it has changed significantly. 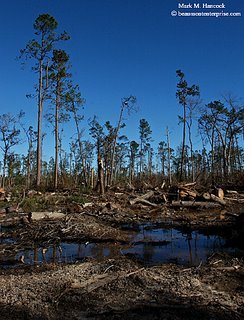 In some areas of the preserve, 98 percent of the trees were destroyed. As we saw last year, this also significantly effected life itself in the bayou. While it would be easy to see the destruction as a reason to quit, the center's leaders have viewed everything as "best" and worked to adjust their plans. The center will still open in the spring of 2007. 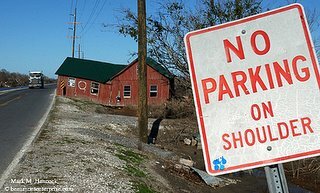 The storm actually resolved disputed issues such as parking areas. Many parking area trees were removed by the hurricane. All remaining trees get to stay. The adaptability of the center's staff is amazing considering the massive damage inflicted on the area. 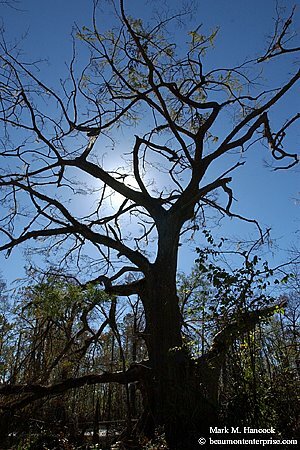 They view the storms as a natural part of a living forest. The strongest survived. Now, they can study the survival and regeneration process of a living forest and its ecosystems. 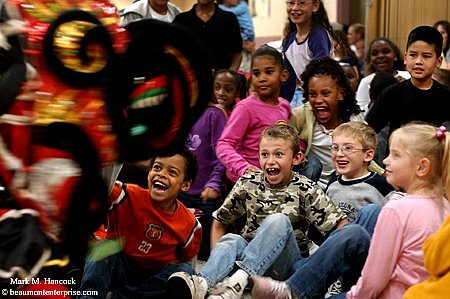 From this perspective, the center is on track to be an educational magnet for years to come. 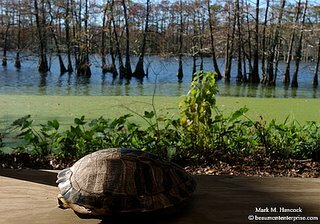 A turtle shell rests in a birding blind at Shangri La Botanical Gardens and Nature Center in Orange on Friday, Jan. 6, 2006. 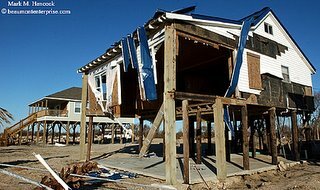 The center, which was seriously damaged by Hurricane Rita, still plans to spend millions of dollars to restore and open in 2007. 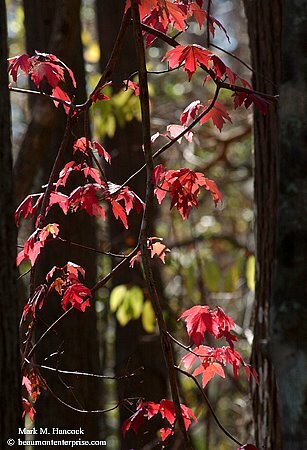 Remaining leaves continue to change color at Shangri La Botanical Gardens and Nature Center in Orange. Administrators expect the finished 252-acre center will be a tourist destination similar to Moody Gardens in Galveston. 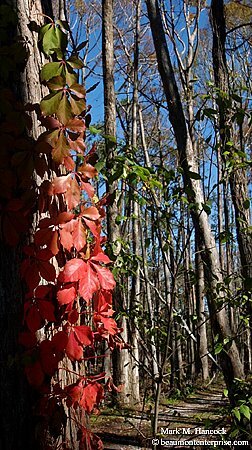 A trumpet creeper plant changes color at Shangri La Botanical Gardens and Nature Center in Orange. Shangri La Botanical Gardens & Nature Center executive director Michael Hoke talks with intern Leticia Villarreal, a wildlife management graduate from Michigan State, in front of an experimental bat shelter at the center in Orange. The bat shelter is a project to protect the endangered Rafinesque's big-ear bat (Plecotus rafinesquii). Unlike similar bats, this bat roosts in hollow trees instead of caves. The lake ecosystem provides educational opportunities at Shangri La Botanical Gardens and Nature Center in Orange. 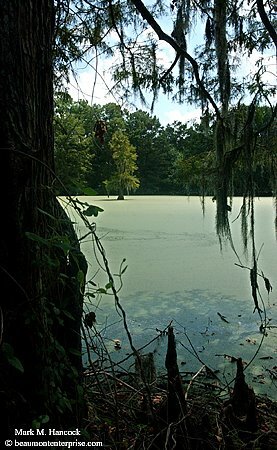 A 1,229-year-old pond cypress known as "The Old Survivor" remains at Shangri La Botanical Gardens and Nature Center. Information contained within the tree speaks of its surviving several strong hurricanes in addition to Rita. 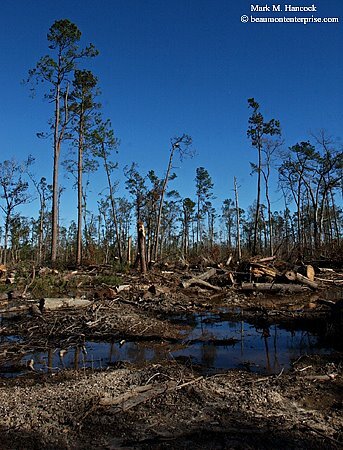 Thousands of trees were destroyed in the 252-acre Shangri La Botanical Gardens and Nature Center in Orange. Please read "Rebuilding paradise" by Jamie Reid. Shangri La Botanical Gardens & Nature Center is scheduled to open to the public in the spring of 2007. The center is extremely well financed. Its director of horticulture is Gary Outenreath, former leader at Galveston's famous Moody Gardens. 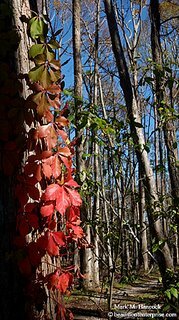 The center features almost 250 acres of pristine wilderness including various ecosystems. It is positioning itself to become a botanical and ecological educational magnet. I planned to post these images around the time Hurricane Rita hit us. Orange got hit very hard and Shangri La took the brunt of the attack. We'll look at Shangri La post-hurricane tomorrow. Today, let's remember how beautiful it was a few days before Rita hit. 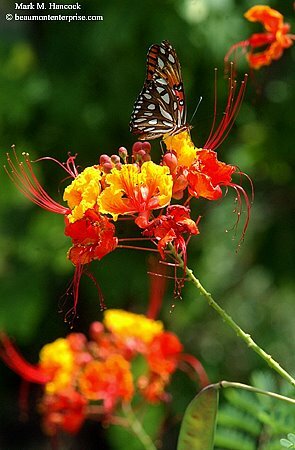 (Right) A butterfly rests on a flower at the Shangri La Botanical Gardens & Nature Center service center in Orange on Monday, September 8, 2005. (Below) An heirloom plant from the previous incarnation of the Shangri La Botanical Gardens & Nature Center (from 1940s to mid 1950s) grows with other plants in a greenhouse at the service center in Orange. 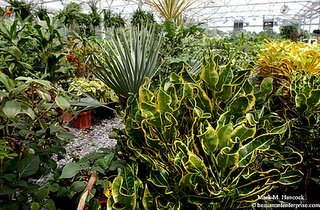 Shangri La Botanical Gardens & Nature Center features educational ecology areas such as the bog area at the main complex in Orange. Due to the large number of birds the area hosts each year, the bog waters need to be reviatalized through skimming and introduction of filtering plants. This will take place before the center opens in 2007. 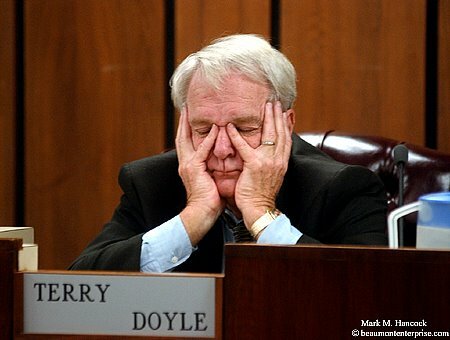 PAISD trustee Terry Doyle shows frustration during a school board meeting at Stilwell Technical Center in Port Arthur on Tuesday, Jan. 10, 2006. The agenda listed disciplinary action against superintendent Willis Mackey. The board went into a closed meeting with the district's attorney to discuss options and returned only to adjourn. Shell Brand Ambassadors Joseph Williams (from left to right), Carlos Valadez and Amber Williams pump fuel and wait to give free gas cards to customers at Johnson Shell Station in Beaumont on Friday, Jan. 13, 2005. 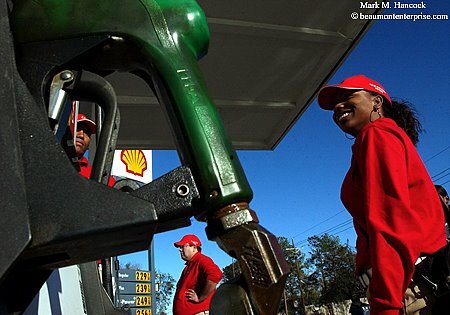 Shell gave $10 gas cards to customers as part of their Keep Gulf Coast Moving program. The company offers the program at selected gas stations throughout Gulf Coast areas affected by this year's hurricanes. 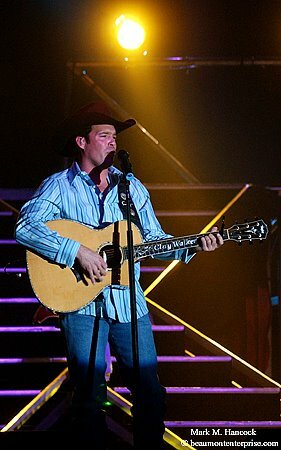 Beaumont native Clay Walker performs in concert during "A Texas Thank You" party for Hurricane Rita emergency workers at Ford Park on Tuesday, Jan. 10, 2006. The event, which was organized by Entergy, included a visit by Governor Rick Perry and a star dedication to Walker. 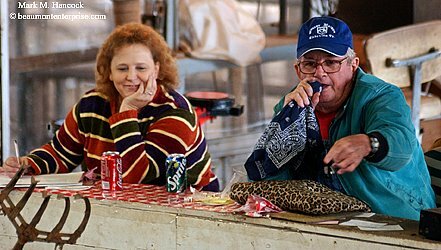 Buyers bid on items as Robert Muckleroy (right) calls the bid during an auction at the Kirbyville Auction Barn in Kirbyville on Wednesday, Dec. 21, 2005. 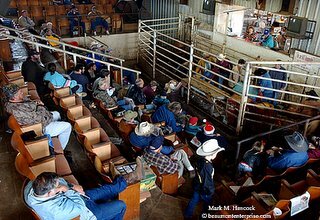 The barn holds auctions each week. 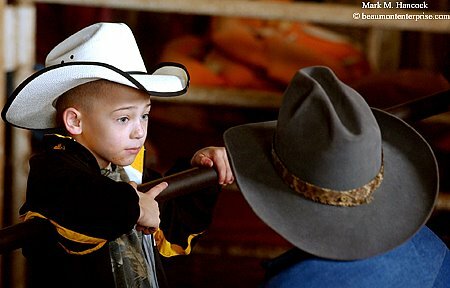 Dalton Rowe, 6, (left) of Jasper talks with his grandfather Larry Veal (right) during an auction at the Kirbyville Auction Barn. (Above) Bertha Parker (left) laughs as Robert Muckleroy calls an auction at the Kirbyville Auction Barn. (Left) Dalton Rowe, 6, rides an electric ATV outside the Kirbyville Auction Barn. Nederland High School's Chris Mayfield (No. 34, left) pushes for more distance from Central High School's Keith Fisher (No. 14, right) during the District 20-4A season opening basketball game at Central High School in Beaumont on Friday, Dec. 16, 2005. The Hurricane Rita evacuation order for Louisiana's Cameron Parish was completely lifted on Jan. 7, 2006 - more than three months after the hurricane hit. 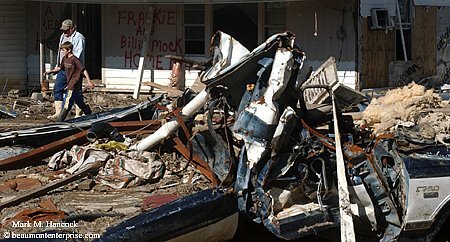 Effectively, residents can return to rebuild their homes. However, they are still subject to a 6 p.m. curfew in a town without stores, fuel or most other common essential items. Most parish residents have returned briefly to check their property and sign releases to have homes demolished. Consequently, there was no rush of homeowners to the area. They already knew their homes were unlivable. 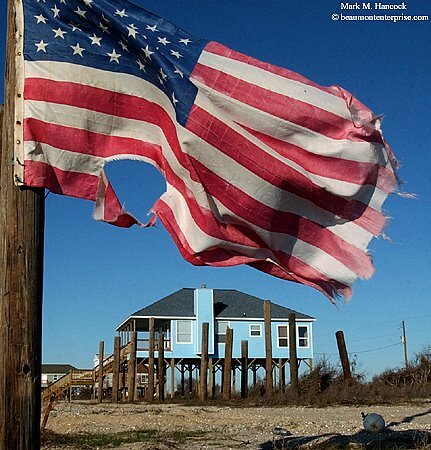 A flag waives near empty and missing homes in Johnson's Bayou, La. on Saturday, Jan. 7, 2006. Officials lifted the Hurricane Rita evacuation order on Thursday for the remaining parts of Cameron Parish. 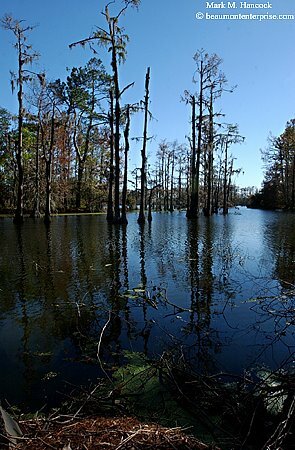 The restriction for Johnson's Bayou was lifted last Saturday. Piers a few feet higher, an architectural change and luck are the only difference between destruction and salvage in Johnson's Bayou, La. 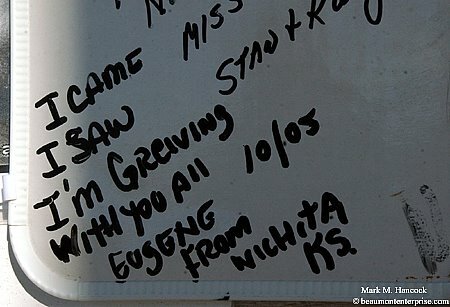 A note written by Eugene from Wichita, Kansas remains on a message board for Constance Beach, La. residents. 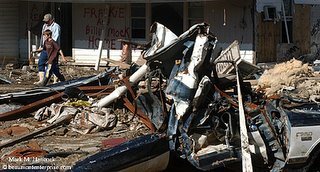 Frankie Mock (right) and his nephew Joseph Burroughs, 11, (left) walk near Mock's destroyed truck (foreground) at his home in Cameron, La. 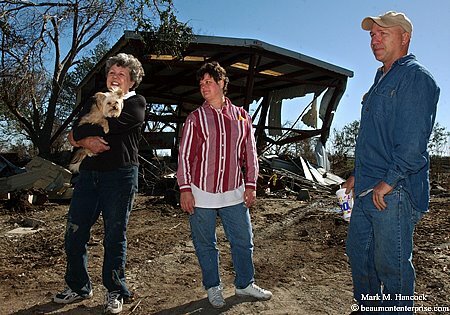 Margaret Savoie (left to right), her daughter-in-law Tina Savoie and her son Charles "Chuck" Savoie collect keepsakes at Margaret Savoie's home in Cameron, La. A truck passes a house parked on the side of the road in Oak Grove, La. Although most displaced homes have been removed from roads, those washed out of the way remain until owners claim them. Reporter Jill Carroll was kidnapped after leaving the office of Adnan al-Dulaimi in the Baghdad suburb of Al-Adil on Saturday morning. Allan Enwiya, an Iraqi interpreter, was killed during the kidnapping. He leaves a wife and young children. First, let's all hope and work for the safe release of Jill Carroll. 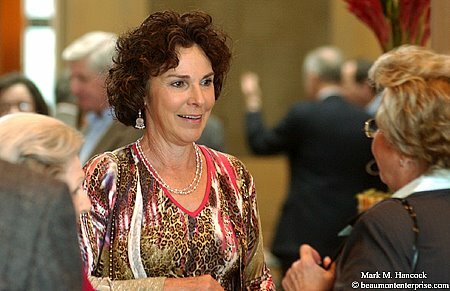 She is a freelance journalist for The Christian Science Monitor. She was investigating and had gone to interview Adnan al-Dulaimi, head of the Sunni Arab Iraqi Accordance Front, when Enwiya was killed and she was kidnapped. Next, and most pressing, Fayrouz knows many of the folks involved in this story. She is collecting donations for the family of Allan Enwiya. It's difficult to explain, but understand these donations are vital because widows in Iraq are basically widows for life. Any small amount is appreciated. 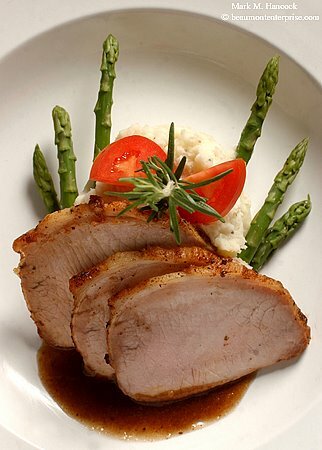 However, it would be best if y'all could dedicate your next freelance gig or aftermarket sale to Allan Enwiya. American journalists in foreign countries depend on local translators to get stories. These freelance translators put their lives on the line to help us, yet they make little money and have no insurance. Please read about this kidnapping and the Enwiya fund, then do what you can. 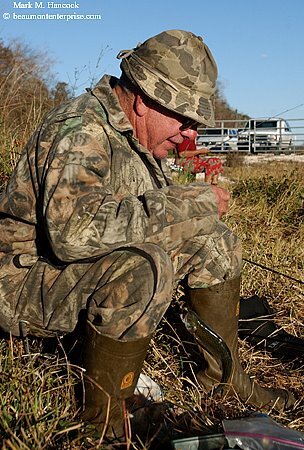 Harry Clark of Beaumont reels in a rainbow trout at a stocked pond off Bigner Road in Beaumont on Thursday, Jan. 5, 2006. 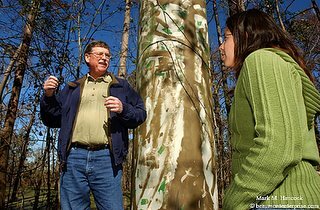 Brian Schlabs, 19, (left) and Katy Thrailkille, 18, (right) talk near a set of removed trees at Ochiltree Inman Park in Orange on Saturday, Jan. 7, 2005. The Stark Foundation will pay to "reshade" the City of Orange by replacing some missing trees. I know, strange composition, but it's better than a tree stump without context. Bando's offers an herb-crusted pork loin with cheddar herb mashed potatoes and fresh asparagus in a hunter sauce at the restaurant in Beaumont on Friday, Dec. 16, 2005. 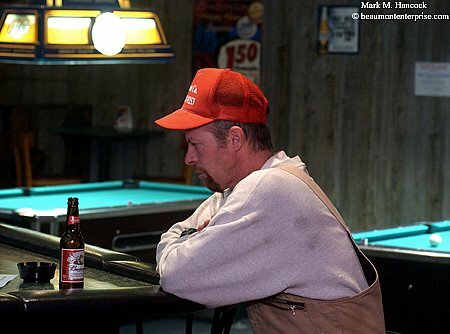 Bob Pickett of Longview, Wash. celebrates his birthday at Shonkwiler's Swillery in Beaumont on Tuesday, Dec. 20, 2005. He came to Beaumont for reconstruction work with G.L. Hunt Co. 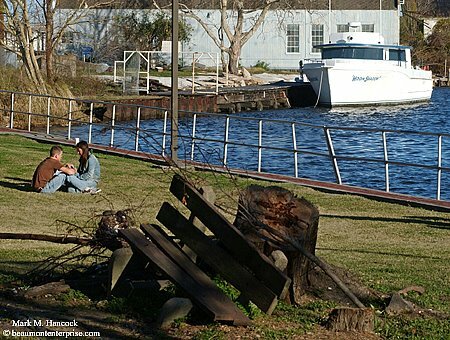 I added this last one to get the feel for Southeast Texas while selecting competition images. Walker is from Southeast Texas and this song really nails the mindset of many in this area. Check out the iTunes samples. Ken Wycoff of Port Arthur fills his truck at Savannah Food and Deli in Port Arthur on Thursday, Dec. 29, 2005. 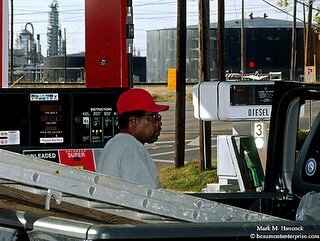 Although many refineries are located in Southeast Texas, area average gasoline prices are the second highest in the state after Dallas. Poblano Grill offers Filet Au Poivre at the upscale restaurant in Beaumont on Thursday, Dec. 15, 2005. 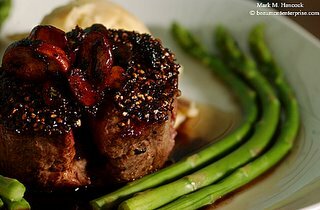 The dish features a beef tender loin filet roasted with peppercorn crust and topped with sauteed mushrooms and a ruby port wine reduction. Central High School's Brandon Moton (No. 32, left) makes a fast break away from Kenyon Harper (No. 10, right) of Bonnabel High School in Kenner, La. 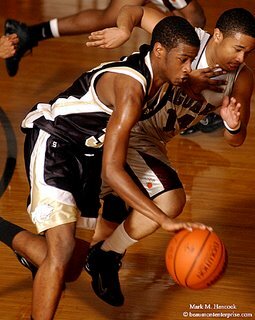 during the James Gamble Classic basketball tournament at Lamar Port Arthur's Carl Parker Center in Port Arthur on Wednesday, Dec. 28, 2005. Congratulations to Port Arthur's Jamaal Charles and the rest of the University of Texas football team for winning the national championship at the Rose Bowl. Here's another look at Charles. 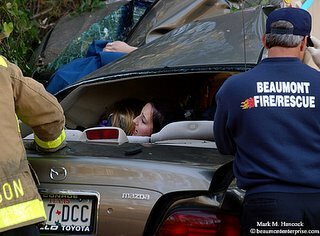 Beaumont Fire/Rescue crews work to extract injured passengers from a car on Phelan Boulevard in Beaumont on Thursday, Dec. 22, 2005. The afternoon wreck forced officials to close the road. 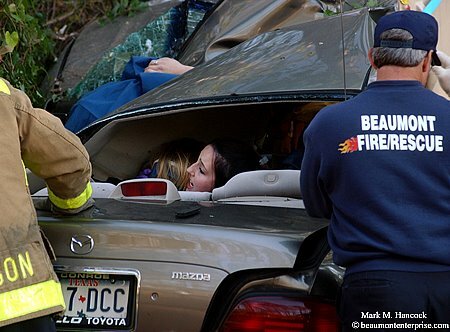 Beaumont Fire/Rescue crews remove an injured person from a car on Phelan Boulevard. 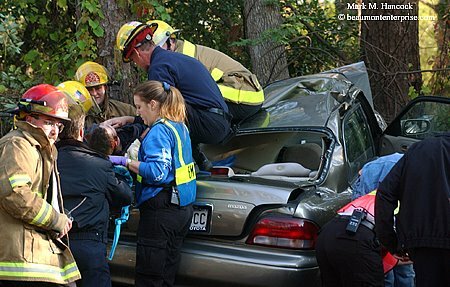 Although two cars were involved in the wreck, only one went into the woods and slammed into the trees. Critique of the day: Bryon Houlgrave - Pro.